Evidence suggests expanded rail operations produce higher ridership gains than more bus service. In researching the article I wrote last week for the Atlantic Cities on bus rapid transit (BRT), I wanted to provide a basic piece of evidence that offered support for the idea that typical bus operations were not offering the sort of service that attracted riders effectively. My sense (hardly a unique perspective, of course) was that bus services in cities around the country are often simply too slow and too unreliable for many people to choose them over automobile alternatives. Rail, particularly in the form of frequent and relatively fast light and heavy rail, may be more effective in attracting riders, but so might, the article hypothesizes, BRT services, which provide many of the service improvements offered by rail. To provide such evidence, I compared ridership growth between 2001 and 2012 on urban bus and rail services on the ten U.S. transit networks that had rail routes in 2001 and did not expand them significantly during that period, as shown in the following chart. I excluded cities with rapidly growing rail networks, such as Los Angeles or Portland, under the presumption that the installation of a new rail line may result in a considerable shift from bus to rail simply because of changes in service patterns resulting from the opening of that line (e.g., riders may be encouraged to take rail rather than bus because certain bus routes are eliminated or re-routed with the opening). 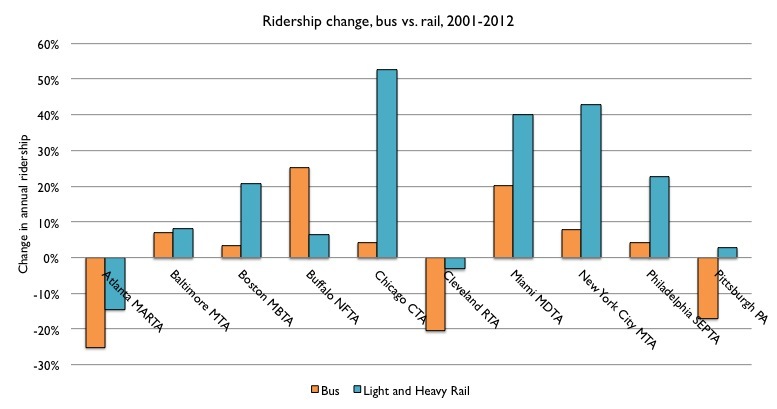 Similarly, as the following chart demonstrates, when evaluating growth of ridership by mode as a share of overall system growth, the evidence suggests that rail lines, new or not, are more effective in contributing to building overall transit ridership than bus services (a slightly different metric than the above chart, which simply compares ridership by mode in 2001 with same-mode ridership in 2012). Of the 27 systems shown here, the rail lines of 22 of them contributed a higher proportion of ridership growth than the bus lines. There is no question that this conclusion about the relative merits of rail in inducing ridership increase is a frequently promoted idea among advocates for rail expansion. A quick review of ridership changes in many major cities is enough to articulate this point. 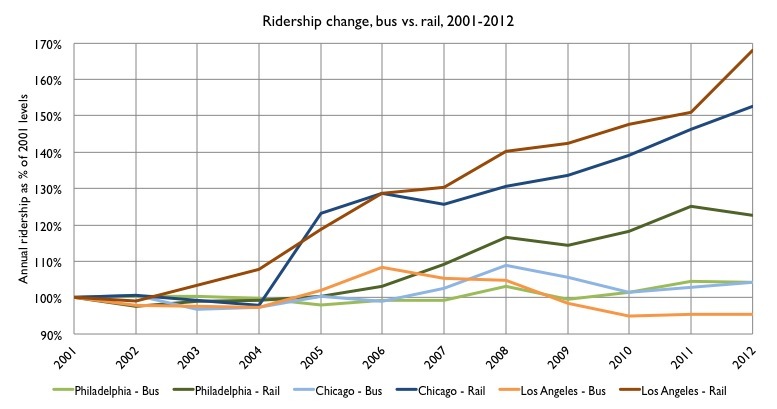 For example, as the following chart shows, in Chicago, Philadelphia, and Los Angeles, the rate of ridership increase on rail services (not including commuter rail) has been far higher than on bus services over the past decade. This comparison, however, is not adequately to say definitively (if a blog can ever do so) that rail produces more effective ridership growth than bus services. It doesn’t take much investigation to find that between 2001 and 2012, Los Angeles dramatically expanded its rail network, adding two new light rail lines. Meanwhile, though Chicago’s ‘L’ rail network saw no extensions, bus services were curtailed dramatically thanks to a difficult funding environment resulting from the recession. What, then, is the interplay between a city’s investment in added transit services by bus or rail and the resulting ridership changes by mode? To begin to evaluate this question, I compared the ridership data presented above (from the American Public Transportation Association) with vehicle revenue hour data (from the National Transit Database). Vehicle revenue hours can be used as a proxy for service provided. ** In theory, if no other variables change, an increase in revenue hours should result in increasing ridership, simply because people are more likely to ride if frequencies are higher. Response to increased service, though, may vary depending on whether bus or rail services are being altered. 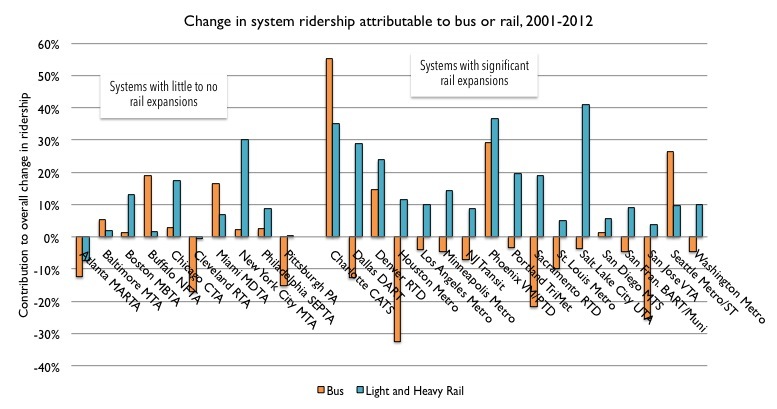 The following chart shines some light onto this question by considering the 27 transit systems mentioned above. The x axis indicates the change in bus or rail revenue hours as a share of total change between 2001 and 2012; the y axis indicates the change in bus or rail ridership as a share of total change. 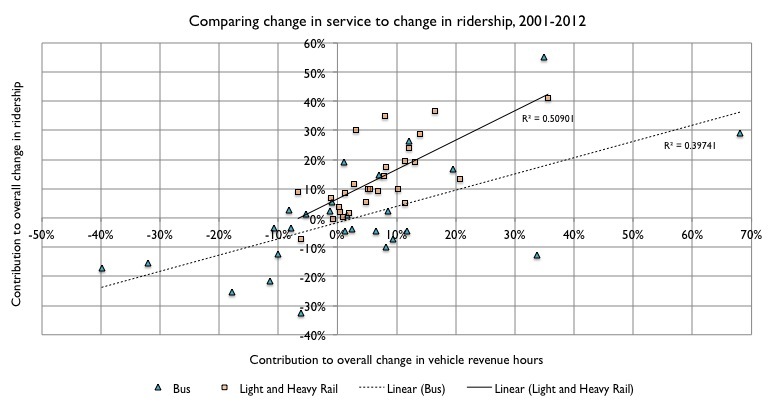 The linear correlation between service increases (or declines) and ridership change is stronger for rail services (r-squared of 0.51) than buses (0.40) for this admittedly limited sample. But the overall conclusion, illustrated by the trendlines, seems to show that increasing revenue hours on rail produces higher ridership gains than on buses. The trendlines indicate that, on average, a 20% increase in revenue hours would produce a 10% increase in bus ridership and a 27% increase in rail ridership. In other words, rail appears to be more than twice as effective in generating ridership growth than traditional bus service. 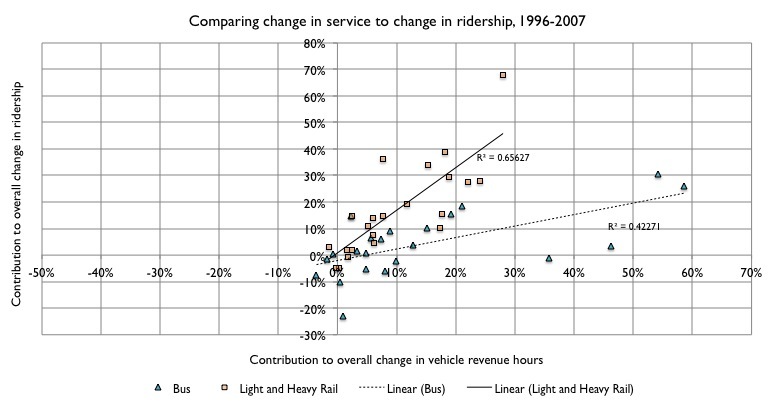 I reexamined these results with a different time period, from 1996 to 2007, comparing changes in bus and rail service hours with ridership. These comparisons (among a smaller sample of 22 systems, most of them the same) provided a similar result, though with stronger correlations and even stronger evidence of ridership response to rail service growth versus bus service growth. In both cases, rail service improvements produce higher-than-proportional increases in ridership on average whereas bus improvements produce lower-than-proportional increases in ridership. This review provides a preliminary and small-sample look at the relative attractiveness of bus and rail services. Clearly these data cannot be extrapolated to assert a “guarantee” that rail service improvements are more effective in generating ridership than bus service improvements. Moreover, other factors, such as changes in bus routes in response to rail openings or other changes, must be considered but are not here. But these data do at least imply that there is a strong preference for rail services over bus, and that from a policy standpoint, ridership is more likely to grow with increases in rail service. Riders respond when they’re offered better service! * I do not consider the impact of BRT lines in this analysis (which, you might note, should put at least an asterisk on the hypothesis I articulate in the Atlantic Cities piece) because of the limited BRT implementation thus far and the fact that most current “BRT” provides mediocre service improvements that do not parallel the advantages of rail. ** There are other metrics that can also be used to measure service provided, such as vehicle revenue miles or vehicles in service. In all cases, a “vehicle” is either a bus or a rail car. A train is made up of multiple vehicles.